Once upon a time, there was a bad little girl. Every time she went out in the city, she would take her red cloak off and pose in front of strangers. One day, an artist appeared. "My, what a big pencil you have!" she said. The artist replied, "The better to draw you with, my dear." 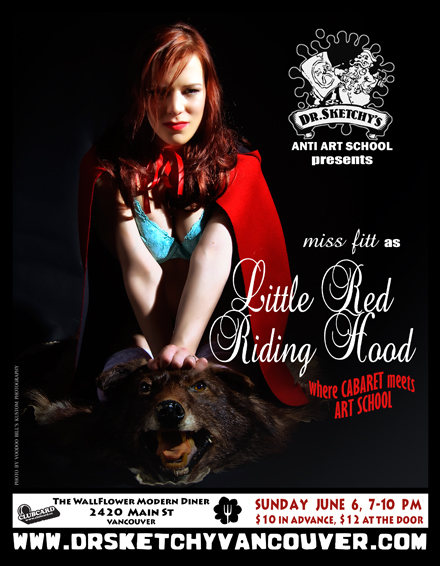 Miss Fitt models as Little Red Riding Hood in our next fairy tale drawing class! Also featuring mask work by AJ Kutchaw. Posted in 2010 and tagged with Miss Fitt. June 6, 2010 by Shary Contrary.